How is your palette looking in Jaspersoft Studio ? Are you tired of easily finding the components of palette to design reports in jaspersoft studio? You can use the combination of "large icons" with "Layout" as "Columns" instead of routine look and feel. 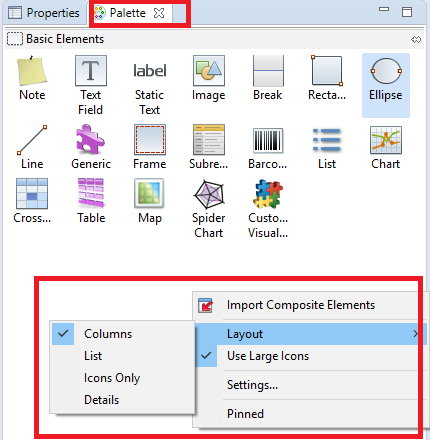 As shown in below image, right click on any empty space in the window, let's say in "Basic Elements" section, right click anywhere and select "Use Large Icons" with the combination of "Layout" as "Columns" and have an easy access to the components when you write some complex reports. ! Cheers! Small things sometimes saves a bit time.